Though often dubbed “the British ’24”, one thing that made long-running BBC spy series “Spooks” (aka. “MI-5”) different was that it wasn’t afraid to randomly kill off its major characters – going through at least three leading men (Matthew Macfadyen, Richard Armitage, Rupert Penry-Jones). Now, the series is jumping to the big screen with “Spooks: The Greater Good” and today Empire has released the first photo from the movie which has essentially been made so that newcomers to the property can enjoy it. 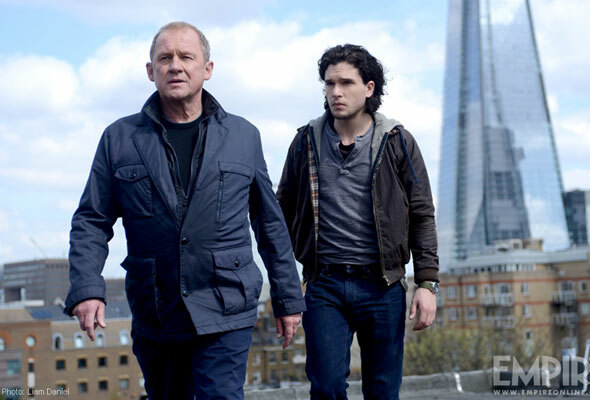 “Pompeii” and “Game of Thrones” star Kit Harington takes on the lead role as Will Crombie who is brought in to investigate the truth behind the apparent death of embattled section chief Harry Pearce (Peter Firth) who was seen jumping from a bridge into the Thames following a scandal involving an escaped terrorist. Crombie must learn the truth about Pearce’s disappearance and the crisis at the heart of Britain’s counter-terrorism agency. Jennifer Ehle, Elyes Gabel and Tuppence Middleton join the cast for the first time, while another returning champ alongside Firth is Tim McInnerny, reprising his role as the slimy Joint Intelligence Committee Chairman Oliver Mace. The film is slated for release sometime in 2015.